I have been busy with my scientific paper and organizing the upcoming collective cooking the past week. Finally, I'm glad that my paper is officially accepted for publication. I know some of you are curious on how it went my last collective cooking as I haven't written any recipe of the Korean BBQ from last weekend. On that day, we were 9 people for the Korean BBQ, the most guest we ever had. As usual, I worked either on appetizer or dessert. They are usually the most interesting part of a meal. 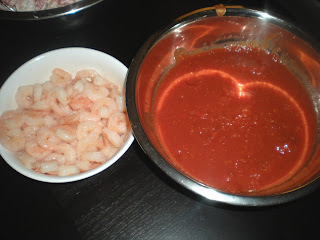 Last week, cooked cocktail shrimp was on special, so shrimp with cocktail sauce is the starting dish. I checked various website and came up a summarized recipe for cocktail sauce. The quantities are vague, so adjust the taste to your liking. 1. In a blender, blend all the ingredients until small pieces of tomatoes are left but not smooth.